Mon, Aug 6, 2018, 10:54 am SL Time, ColomboPage News Desk, Sri Lanka. 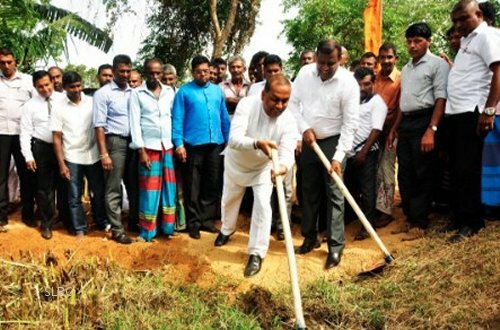 Aug 06, Colombo: Minister of Agriculture Mahinda Amaraweera says that steps will be taken to renovate the abandoned water reservoirs in the country under the 'Thousand Tanks - Thousands Villages' development program to provide irrigation water to the farmers to cultivate both Yala and Maha seasons. The Minister made this observation addressing the ceremony held yesterday (05) to launch the renovation of the 297th tank, under the 'Thousand Tanks - Thousands Villages' project, Pahala SiyambalagasWewa at Katukeliyawa in Hingurakgoda at a cost of Rs. 2.5 million. It will provide water to 90 acres of paddy and benefits to many farmer families. In addition the renovations to the 298th and 299th tanks, Iriyagolla Tank in Matale and Pallipola Thumara and Booweruea Tanks were also launched under the patronage of Minister Mahinda Amaraweera. The Minister also distributed jak fruit saplings and organic fertilizer to the farmers. Speaking at the occasion Minister Amaraweera said according to the news broadcast in some media, there are only issues in this country and people think that no development activities are carried out. "There are about 27,000 tanks and anicuts in our country's irrigation system. A large number of them have never been repaired. Villagers are asking us to renovate the tanks," he said. Therefore, this year, the Ministry of Agriculture has allocated Rs. 3.5 billion for reconstructions of tanks alone, he added. The Minister said the 'Thousand Tanks - Thousands Villages' development program to renovate the tank system, includes the preparation of the tank bed, strengthening the tank bund and development of roads and other infrastructure. He explained that the tanks are filled with silt and aquatic weeds. With a week of rain the tanks overflow as well as dry out if it doesn't rain for two weeks. The Minister lauded the President's support for the development of agriculture, especially for the renovation of the tanks. "Today, we received funds to build these tanks because we have a leader who knew about farming. President Maithripala Sirisena is a farmer's son so he knows what the people in the village need," he said. "Some people today are asking us what we have done. We ask what we did not do. Is there another government that gives relief to the people as much as this government? We have provided a huge amount of money to provide relief to the farmers during the past three years. We provided more than Rs. 100 billion for drought relief, flood relief, agricultural insurance, fertilizer subsidy, etc." Secretary to the Agriculture Ministry, B. Wijeratne, Agrarian Commissioner General W. M. M. B. Weerasekara and a large number of officials also participated in this event.